Cours Hattemer is a French private, secular school. It is independent of the state, and can follow its own teaching approach, which is structured and places great stress on repetition to drive home what has been learned. The school has many well-known alumni including the actress Brigitte Bardot and the French President Jacques Chirac. The school was founded by Rose Hattemer of Alsace in 1885. The founder taught some of the great Parisian families towards the end of the 19th century, and developed a method of teaching by correspondence for the children of diplomats, which is still followed today. 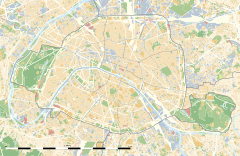 The school was originally located on rue Clapeyron in the 8th arrondissement of Paris. It is now housed in a five-story building erected nearby on rue de Londres in 1935 to accommodate a growing number of pupils. There is a cafeteria, gym and playground. The yard is small, with no trees, and the small gym is located in the basement. The school provides flexible hours, so a student may take time to practice an instrument or train for a sport. When Brigitte Bardot was admitted to the Cours Hattemer at the age of seven during World War II (1939–45) she only had to go to school three days a week, and otherwise studied at home.This gave her time to take dancing lessons. In the period after World War II the school was one of the few that encouraged art, and thereby attracted pupils from the families of actors or public figures. It catered to children who were "special cases" such as Françoise Sagan and her classmate Florence Malraux, daughter of André Malraux, who attended in the early 1950s. There are about 1,500 students from kindergarten to the Baccalauréat (high school certificate), half of whom learn by correspondence. Classes have 15–25 students. Annual fees as of 2012 were between €5,000 and €8,000. Hattemer is a private school that is not under contract to the government and so has freedom to set its own curriculum and teaching methods. Students and their parents are screened to ensure they agree that a child who is learning is a happy child. The school's teachers write the textbooks. The school uses structure and repetition in its classes. Constant repetition of content in oral and written questions includes reviews of what was learned in a day, a week and a year. In 2010 the headmaster of twenty years, Jean-Pierre Jousse, retired and was replaced by Pierre Lansonneur. While keeping the proven teaching techniques, Lansonneur planned to reinvigorate the courses. The school was also planning to start publishing the textbooks developed for internal use so they could be sold to other schools, and to develop Internet support for the correspondence courses. Princess Stéphanie of Monaco (born 1965), singer, fashion model. ^ a b c d Beyer 2013. ^ a b c d e f Montclos 2012. ^ a b Historical Background – Hattemer. ^ Singer 2006, p. 10. ^ Cittone 2013, p. 26. ^ Berest 2015, p. 7. ^ a b Tarlé 2013. ^ Quelques Anciens Celebres – Hattemar. Berest, Anne (2015-06-15). Sagan, Paris 1954. Gallic Books, Limited. ISBN 978-1-910477-15-1. Retrieved 2015-07-01. Beyer, Caroline (2013-09-20). "Hattemer, l'école où le CE1 s'appelle «10e» et où la répétition est plébiscitée". Le Figaro (in French). Retrieved 2015-06-30. Cittone, Laurent (2013-12-05). Étienne Péclard, une carrière en mouvement. BoD - Books on Demand. ISBN 978-2-322-03488-8. Retrieved 2015-07-01. "Historical Background". Hattemer. Retrieved 2015-07-01. Montclos, Violaine de (2012-10-04). "Hattemer, les secrets d'un miracle scolaire". Le Point (in French). Retrieved 2015-06-30. "Quelques Anciens Celebres" (in French). Hattemar. Archived from the original on 2015-06-18. Retrieved 2015-06-30. Singer, Barnett (2006-07-06). Brigitte Bardot: A Biography. McFarland. ISBN 978-0-7864-8426-3. Retrieved 2015-07-01. Tarlé, Sophie de (2013-04-15). "Nouvel élan pour le cours Hattemer". L'Etudiant (in French). Retrieved 2015-06-30.